this week's post marks the third in a series of cassettes gifted to us by educator cliff sloane. a former professor of ethnomusicology and founder of asianclassicalmp3.org, a major influence behind this blog. 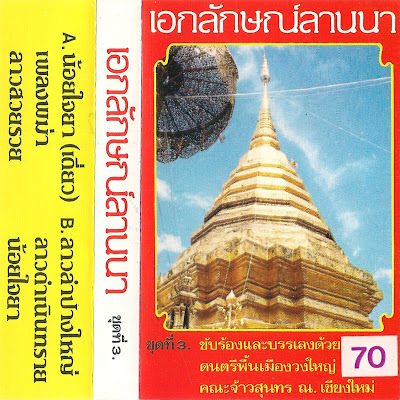 our third tape from cliff features the ensemble of chao sunthon na chiang mai presenting volume 3 of their "lanna identity" series, focusing on solo vocal performances with orchestral backing. born into the chiang mai royal family, chao sunthon left the northern capitol and moved south to central thailand to study classical music. upon his return, he became a central character in the preservation and continued innovation of northern thai local music, composing new melodies, hand-crafting the finest local instruments and instructing young musicians at the chiang mai college of dramatic arts. he passed away in 1986 at the age of 68.